Sterling Silver Mothers Rings - 15 Personalized Rings Mom Will Love! Our rings are available in many styles and price ranges. Prices start at under $30, so you’re sure to find the perfect gift for your Mom no matter what your budget is. 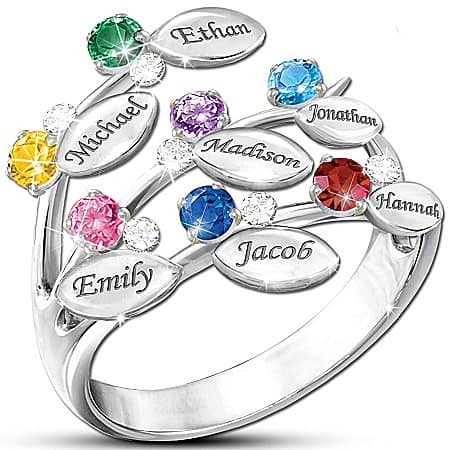 Create a custom gift for your Mom by having her children’s names engraved on her ring! This striking engraved ring for Mom features a unique leaf design that reminds everyone of a family tree. Each leaf has a child’s name engraved upon it (you can add up to 7 children). The corresponding CZ birthstone is placed next to the leaf, and additional clear CZ stones are added for a little extra dewdrop shine. A truly unique look for any woman who cherishes her family. Mom will look fashionable and be reminded of her loved ones every time she wears this ring with her kids names and birthstones. This lovely ring features up to 6 heart-shaped birthstones, with the kids names engraved in script next to the gem. On the inside of the ring is a hidden message which states, “My Family, My Heart”. Perfect for Christmas, Mother’s Day or Mom’s birthday! Click here to see this ring in gold. 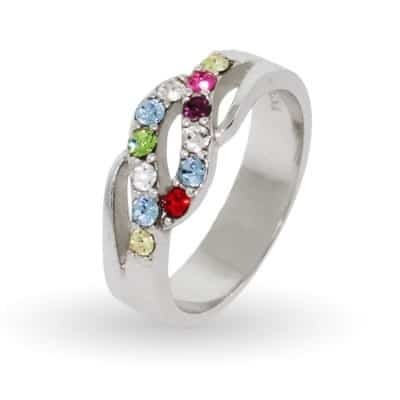 Combine the brilliance of diamonds with the colorful sparkle of birthstones to create a ﻿﻿one-of-a-kind keepsake ring﻿﻿ that Mom will always treasure! This sparkling sterling silver ring for Mom features up to 6 marquise-cut Austrian crystal birthstones set in a diagonal pattern across the ring. A band of genuine diamonds is nestled on each side of the birthstones. Mom will love opening this heart-felt gift on Christmas, her birthday, or Mother’s Day. Silver or gold – it can be a difficult choice! Mom won’t have to worry if her ring matches her other jewelry with a two-toned ring. This﻿﻿ strikin﻿﻿g band is accented with 24k gold plating for an elegant look. Up to 6 children’s names and birthstones are intertwined in a shimmering, wave design. 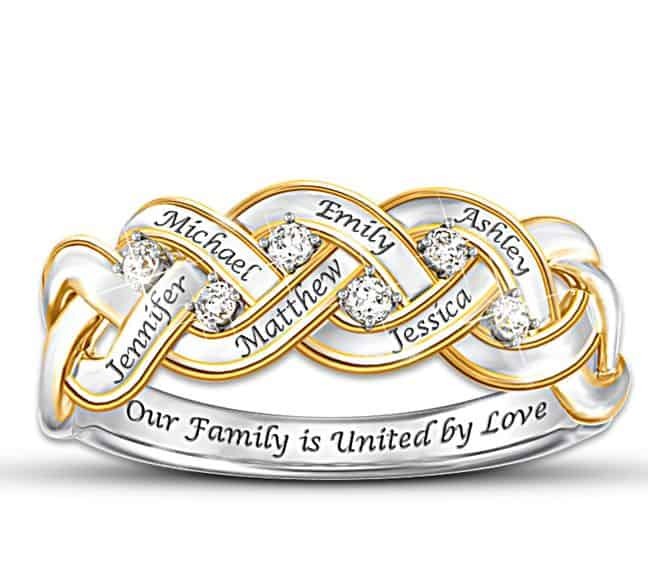 Engraved on the inside of the ring is the touching sentiment, “Our family is a circle of love”. Heirloom-quality ring is sure to become a treasured keepsake! Mom or Grandma will be thrilled each time they at their hand and see this elegant diamond mother's ring! 6 genuine diamonds sparkle brightly on this solid sterling silver ring. Up to 6 names are engraved and enhanced by brilliant 18k gold accents. Let Mom know that she’ll always have your heart by giving her one of these delightful heart-shaped sterling rings. The sterling silver open heart is set with the birthstones of up to 6 family members. The polished bars on the side of the rings are beautifully engraved with the children’s names in an elegant script font. Stacking rings are one of the hottest trends in jewelry right now. If your Mom is the fashionable sort, she’ll love wearing stacking mom rings. These engraved stacking birthstone rings are sure to become Mom’s favorite rings. Each ring features the name, birthstone and birth date of a loved one. The slim rings are just 3 mm in width. They look beautiful on their own, or you can combine several bands to create a custom look that can be changed whenever Mom wants. Does Mom or Grandma have her own individual fashion style? Then she’s sure to enjoy this unique infinity design Mother’s ring! 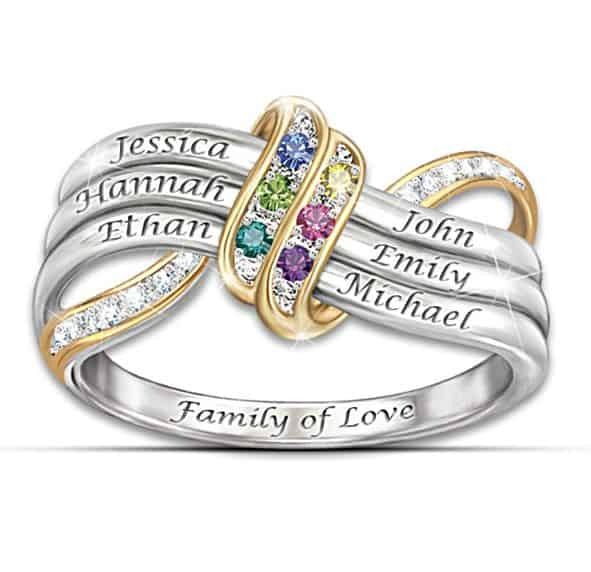 Solid sterling silver ring features up to 6 children’s names and birthstones wrapped by two 18k gold-plated bands. 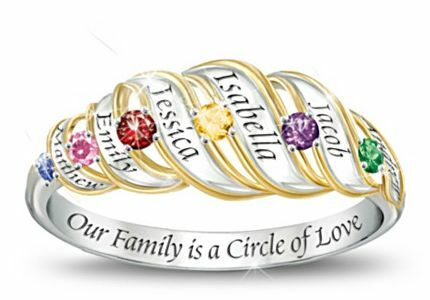 The inside is inscribed, “Family of Love” – a beautiful symbol of your family’s loving bond! If you’re looking for a ring for a woman who’s been blessed with a larger family, this affordable 12 birthstone Mother’s ring is just the ticket! Priced at just under $50, this gorgeous ring is a stylish way to celebrate Mom’s pride and joy in her family. Is your love for Mom bigger than your budget? Don’t worry – you can still delight Mom with a beautiful ring without spending a fortune. This dainty heart-shaped sterling silver ring features up to 6 birthstones – and is priced at just under $30! An affordable yet memorable ring that Mom or Grandma will treasure for years to come! Does your Mom have a classic sense of style? If she does, then she’s sure to appreciate one of these classic family rings with birthstones. 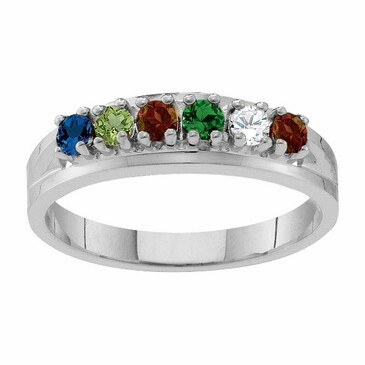 This stunning classic mother’s birthstone sterling silver ring features up to 6 birthstones. You have the option of simulated stones, or you can order genuine birthstones (extra fee applies). Have you left your shopping until the last minute? Don’t worry – this ring can ship out in 2 days. If you use overnight shipping, you can have the ring in just 3 days, so Mom will never know you waited! Your mom is one-of-a-kind – her ring should be equally as unique! This modern Mother’s ring is elegant and timeless. Engrave up to 6 family member’s names in a sophisticated cursive font. The center band features genuine diamond accents that add a finishing touch of class.